Earlier in the week, I shared with you that I was working on an experiment to make a block in a more fabric efficient way. 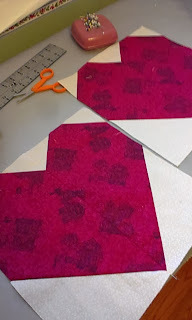 The pattern that I really like, and I think I will be making a few of these quilts, is called Paper Hearts by Tula Pink. I bought the book that the pattern was in. It's called Sew Red. Each of the sub-blocks is half a heart. The bottom of the heart is made by putting a square of fabric at the bottom of the larger rectangle, and sew a diagonal line. Then cut off the corner. This is the part that bothers me. 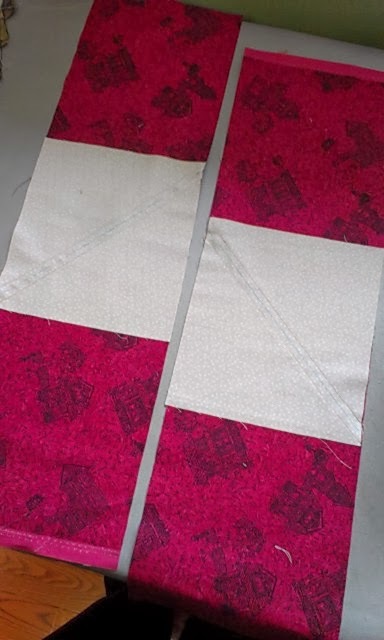 One way to save the wasted corner fabric is to sew another line and there would be a large half square triangle to use in another project. But for me I would rather be more efficient in using the fabric. So with a little thought, I calculated a way to add 3/4 inch to one side of the light square and put it in the middle of a fat quarter strip of the proper width. Then sew the two diagonal seams and cut them apart. Do that again on a second strip with the diagonal seams going in the other direction. (it's hard to see in this picture but it's there) This method makes two blocks. There will be a little to trim off the top of the sub-blocks before proceeding with the corner triangles. These corners are diagonal stitched, and lopped off too. But they are smaller so it's not as big a waste. So, do you like Tula's design? I really like it. And I like the colors she chose. So, using my my fabric-efficient method of construction, I will definitely be making one or two of these quilts in the new year. I'm glad I tried this and I now have two more blocks to go in my "Misc. blocks" box. I continue as per the pattern directions. 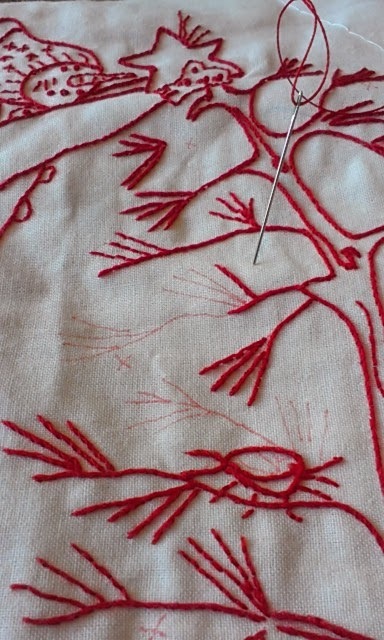 Sewing the little squares to the corners. 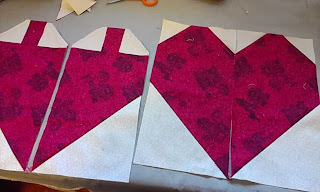 Then sew the two halves together. Early in the week I found some unexpected sewing time. Thank goodness because, it was those couple of hours that helped me achieve my goal this week. I did get part of my stretch goal done by cutting the 80 plain alternate blocks. 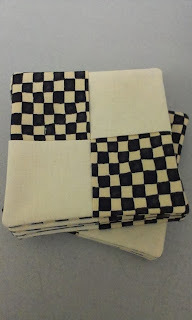 I tea dyed some plain white fabric because the quilters do not like quilting on white unless it's a blue quilt. So their off-white blocks are all cut. I haven't decided what color the side setting triangles will be, so they are not cut. But when I do decide, they won't take long. 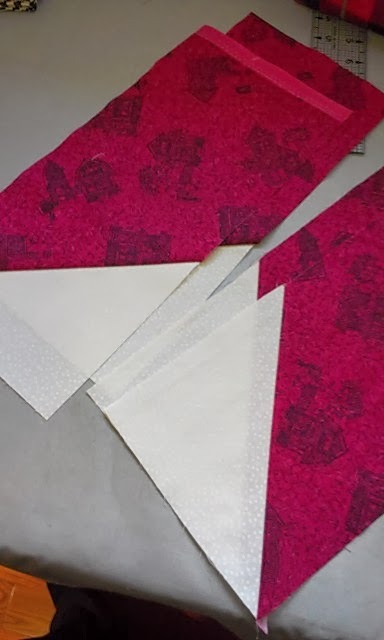 So what's my plan for this week.... to decide the color of the side triangles and the binding; to cut them out; to make the 350" of bias binding. 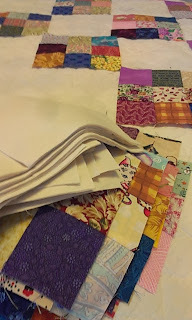 And I will lay out the blocks on the bed ready to sew. That's a pretty light week, but I think this is going to be a busy week. I'll say my stretch target will to have half the quilt sewn together. Testing a new Block Construction method. 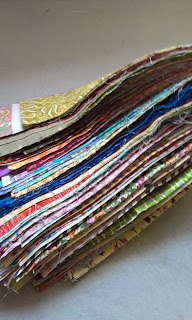 I'm thinking about making a fun little quilt using various red fabrics. I bought the book that the pattern was in, and I was not really happy with the wasteful method for constructing the blocks. So I'm inventing/testing a new way to make the blocks that will use less fabric. These are my test blocks. I'll finish up the test blocks either tomorrow or on the weekend, and share what the pattern is. Are you frugal when it comes to block construction? Grace wasn't feeling well today, so she didn't go to school. Her mama dropped her off early, and she spent the morning under a cozy blanket on my couch and slept off her nausea. This afternoon, I had a meeting with other local guild leaders today at the second cup so since Grace was feeling a bit better, she joined me for my meeting. While we four girls were busy discussing works of our guilds, a man at the next table was busy writing on a napkin. When he was done his coffee, he pointed at Grace, then pointed at his napkin. Grace went over to his table, under our 4 pairs of watchful eyes, to see what he had. 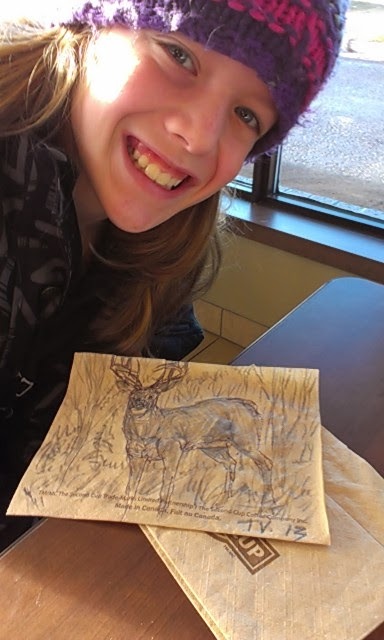 He had drawn this beautiful deer, and signed it TV 13. Through some quick investigative work at the Second Cup, we know his last name is Vickers. How lucky... Grace is going to save it forever. If you recall, Grace is an animal lover. She normally goes for cats first, then dogs and horses. But she thinks deer are nice too. I'm going to try to make a few crafty things this week for our guilds and silent auction in two weeks. 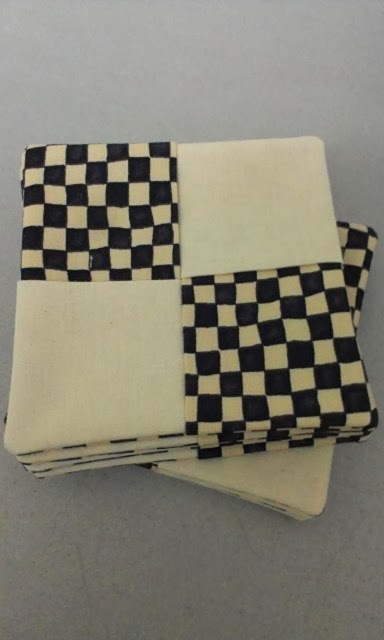 The first thing I made were two sets of these little criss-cross coasters. These are always a favorite to make. So slick. My grand-kids like to make these because they are so easy, but look so complicated. Have you ever made these? The tutorial is here if you want to give them a try. I don't use the fusible layer that this tutorial calls for. I find the 5 layers of fabric plenty of padding. In our house, we also use these coasters to fling across the living room, frizbee style. If they land on the chair in the corner of the room, you're a hero. Next, I made four infinity scarves that go around your neck twice. So cozy for this time of year. Because I had white thread in the sewing machine, I made these four that are light colored. Tomorrow, I'll make dark ones. I haven't decided which ones to bring to the auction, but I'll bring four. Today, I'm in Sussex teaching a class. You might think it's a Christmas project, but you would be wrong. We are working on a Canada Day Quilt. There is just something about sewing Christmas projects in July and summer projects at Christmas time. Maybe because it's not a last minute project and there's lots of time to finish... who knows. 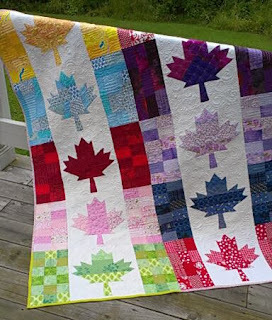 I love this "Oh, Canada" pattern by Cheryl Arkinson. She released the pattern in late June, and I bought it right away and within in days, I was well on my way to having the top done. And then days after that, on Canada Day actually, it was fully finished....that means free motion machine quilted and then bound.. I knew that I would love to teach this class so with Cheryl's permission, I added it to my portfolio of classes. Stay tuned for some photos from the class. Whew, that was a quick week that just passed by. I did get all my strips sewn together. 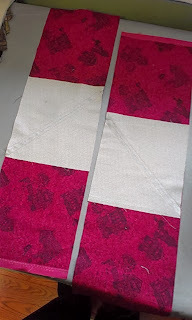 After pressing all the seams to one side, I did meet my stretch target to have all 40 of these 21" strips cut into 2.5 segments. So the math tells me I should have somewhere around 320 three-patch strips. 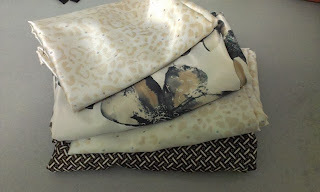 A few extras will help me out of some color traps when I'm coming to the end of sewing these nine-patches together. This week, my plan is to sew these into the required 99 nine-patches and to get them all ironed. My stretch target is to cut out the plain alternate squares and the side setting triangles. I like making small weekly goals because this week I had many other little things to do. Next week is looking the same. This strategy works well for me. 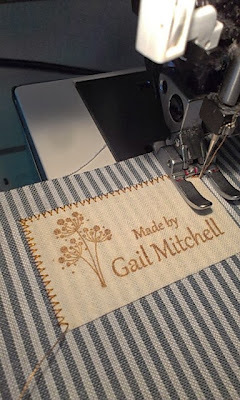 Do you have to micro-manage your sewing too? I love Fruitcake. 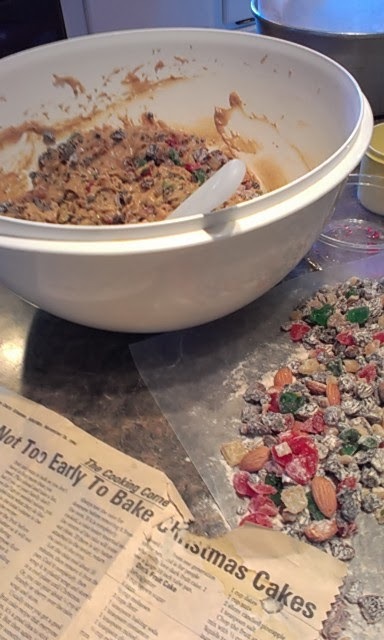 I should say I love home made fruitcake. Last year I made fruitcake with Linda H. It was delicious. We were eating fruitcake well into the spring of last year. Such a treat. Her beautiful layered recipe made three loaf pans. It was fun to make it with her. When I say we, I mean it. Mert is good at chopping all the fruit. This year, I'm way behind. Since we are heading south right after Christmas, I considered not making any this year. But it nagged me and I decided this past Tuesday, that I'd make just the one. The dark one. 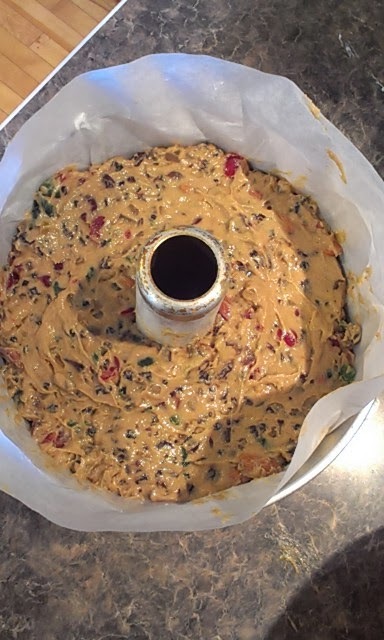 I picked up all the ingredients at our local Scoop and Save, and today is the day we make it. What we don't eat at Christmas time, we will take south with us for a treat. 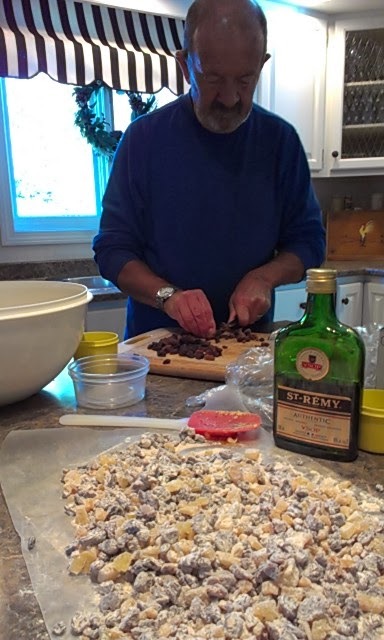 The recipe is my old favorite from the Daily Gleaner newspaper from 1994. The recipe is here if you are interested. Can you believe that newspaper clipping is 19 years old. 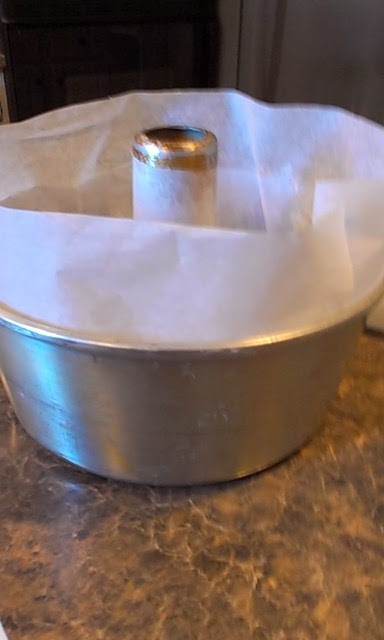 lining this Angel cake pan with parchment and shortening. Maybe Santa will bring me a straight side fruitcake pan! oven now. Now I feel better! I'm feeling great about spending some quality time with my sewing machines this week. I've not done much since about the first of October when we started our kitchen renovations, then went away on vacation. Since the weekend, I've got a good start on my church raffle quilt, I've hemmed two pair of pants for a friend who lives in a seniors home, and I've made some Christmas table cloths for the Stan Cassidy Center. In addition to this, I've attended two guild meetings, and I'm feeling like I'm right back in the swing of things. Yesterday, I was at Country Crafts and Curtains quilt shop. I picked up some Warm Tater batting to make the microwave potato pouches. This special batting is made with no resins or glues that might catch fire if used in a microwave. 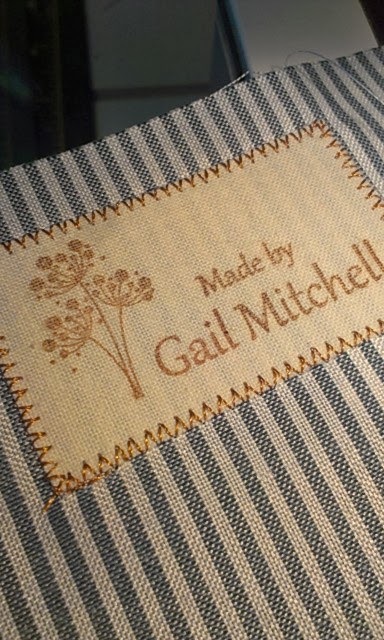 When making this, in addition to the 100% cotton batting, you need to use 100 cotton fabric, and 100 cotton thread. When you buy the batting, the microwave potato bag pattern and cooking instructions are on the paper that comes with the batting. This morning, I made a bag. I'm calling this first potato pouch a prototype. That is because when I did the fold, I did it differently than what I was supposed to do. Grrr.. So this potato pouch will be ours and we will test it out tonight. 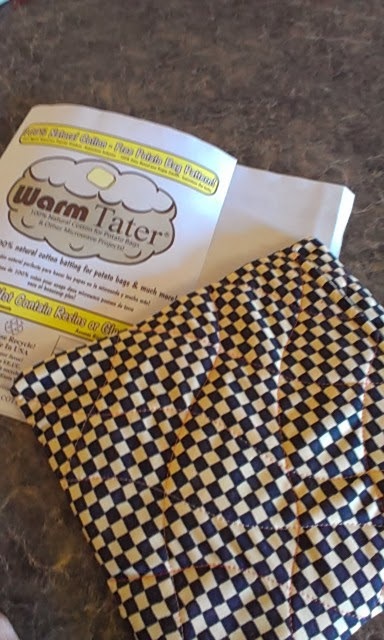 They say this bag makes the best baked potato that you will ever have. Have you tried them? I have 3 more cut out, and when I make these next ones, I will make them a bit different. They will be nicer and will be for our guilds silent auction of crafty items next month. Also, did you check out my friend Linda's blog. She put a pattern/tutorial for a little teabag tote. I think I'll make a couple of those for the crafty silent auction too. St. Dunstan's 2014 raffle quilt is a simple quilt. 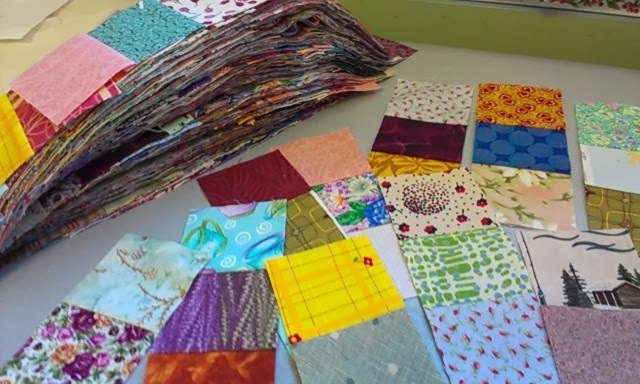 The members of the hand-quilting group want to do something simple, with straight line quilting this time. When they saw this 1930's nine-patch, they all thought it was classic, and quickly decided that this would be the one. Now that my holiday is over, I need to get cracking to make this quilt for them. Since I'm going away right after Christmas, this top needs to be done and delivered on December 19th, their last day of quilting before Christmas. They will only start quilting on it in February. I'm breaking up this project into small chucks and will complete them over the next five weeks. 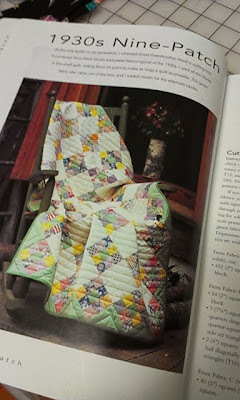 This way, I can work on other projects without feeling like I should be working exclusively on the church quilt. It's a strategy that works well for me. So, this first week, I will work on making 99 nine-patches. These nine patches are not the light/dark variety. They are just varied fabrics with no plan for contrast. Today, I cut 120 half-wof strips and I'm ready to put in a few of hours of strip sewing and ironing this weekend. A stretch target for me might be to sub-cut them into the 2.5" segments. Check back next Friday, to see where I'm at. 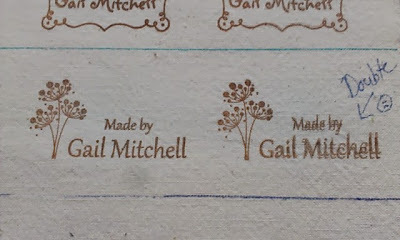 I have been looking for a nice and easy way to add a "made by me" label to the small gifty items I make to give away. I have no idea if this will work or not, but time will tell. I decided to order myself some custom jelly stamps. They are like rubber stamps, but without the wooden blocks. You apply your jelly stamp to an acrylic block, do your stamping, then clean it, remove it from the acrylic block and store it away. 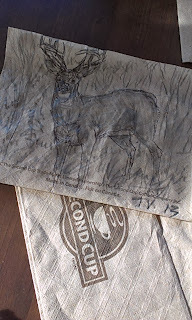 I think these stamps are mostly intended for paper, but I'm using cotton. I got my acrylic stamping block at Michael's. I started out by ironing a piece of washed muslin to paper backed fusible Pellon 805. 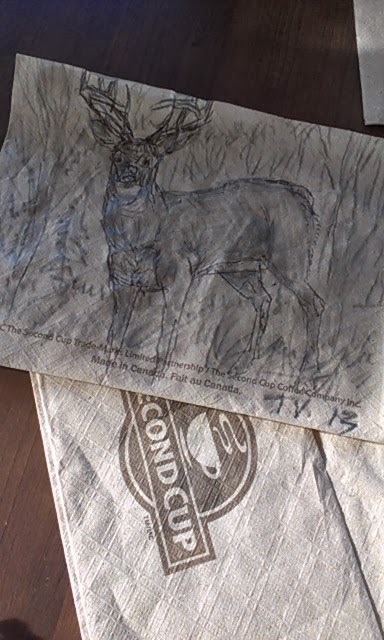 I only own one stamp pad, so I used it to start my experiment. It is ordinary archival based ink. Here are some of my notes so far. Note 1 - Be careful not to move the stamp. Test 2 - Be careful to give even pressure. Note 4 - Use a heavier fabric so you don't see the under fabric. Not bad for the first label. 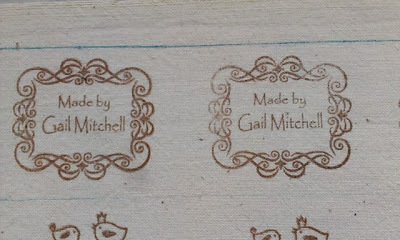 I did iron this little label on before stitching around it. This particular label will be on the inside of a little zippered pouch that I'm making for a silent auction at the guild next month. I like it And I like the brown color of the ink as well. But you can be sure that I'll be checking out Michael's selection of other colors. I'm not sure if it will be waterproof. 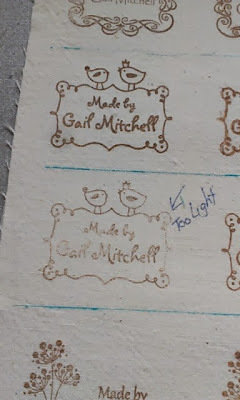 I may do further experiments and try one of my mis-stamps to see if it runs after heat setting. But for now, I will only use on items that will not likely be washed. So, what do you think. Do you like the idea? I may do a small demonstration at guild next week. We're back from our cruise holiday. It's good to be home but this cold weather sure was a surprise. It's only been two days, and we feel that the jetlag is behind us We're getting back to eating single course meals and multi-grain bread. I won't disclose the amount of weight gain, but just know, that we are hard at work to get things back to normal. It was nice to get back into my sewing room and while I'm not quite sewing yet, I am organizing and making lists of things I need to do and prioritizing them. Sewing will start tomorrow, maybe. Just since we are back, its dawned on me that Christmas is right around the corner and I have a couple of things that really need to get done before we head south, which is right after Christmas. So, an organized approach is what is needed to get myself geared up to meet all my deadlines. I'll show you a little project that I did make some progress on while away. 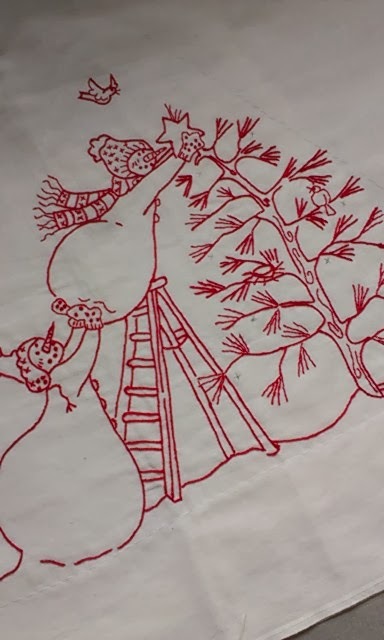 I took this little "Trim the Tree" stitchery with me to finish. 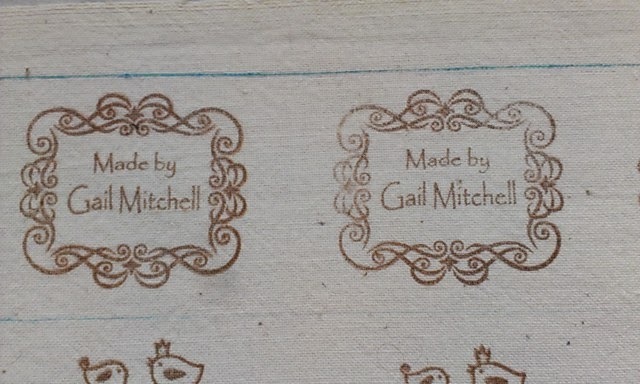 Last year, I was so excited when I saw that Country Crafts and Curtains had the pattern in stock and I started it right away when I got it. But soon after, it sat half done on the coffee table for a couple of months. So I thought it was a perfect project for me to take with me to work on in the airports etc. I did find time to do about 1 needle a day, and by about day nine on our trip, it was done. 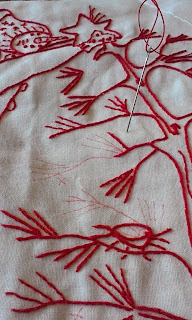 I snapped this picture as I threaded my last needle full of thread. There was only a few twigs left to do. I was pretty happy it was almost done. So that means somewhere half way new my to-do list, will be to finish off this in time for Christmas. It is intended as a pillow cover, but I think I will make into a little wall hanging but still using the scalloped border that the pattern calls for. I just love the sweet snowmen. I'll show you when it's done.